Description - Our 6.5mm Coin Flex Tiles were designed to be premium multi use floor tiles. These durable and yet slightly flexible floor tiles work exceptionally well as a commercial or residential garage floor tile, however, they are also excellent in a variety of other locations such as trade show exhibit flooring, workout room flooring, and basement flooring. Your choices are virtually endless. Additionally, the coin pattern helps provide a non-slip flooring surface that can still be easily cleaned. These garage floor tiles are also resistant to most solvents and chemicals and act as excellent thermal and acoustic insulation. Recommended Uses - The 6.5mm Coin Flex Tiles are an excellent multi use floor tile. 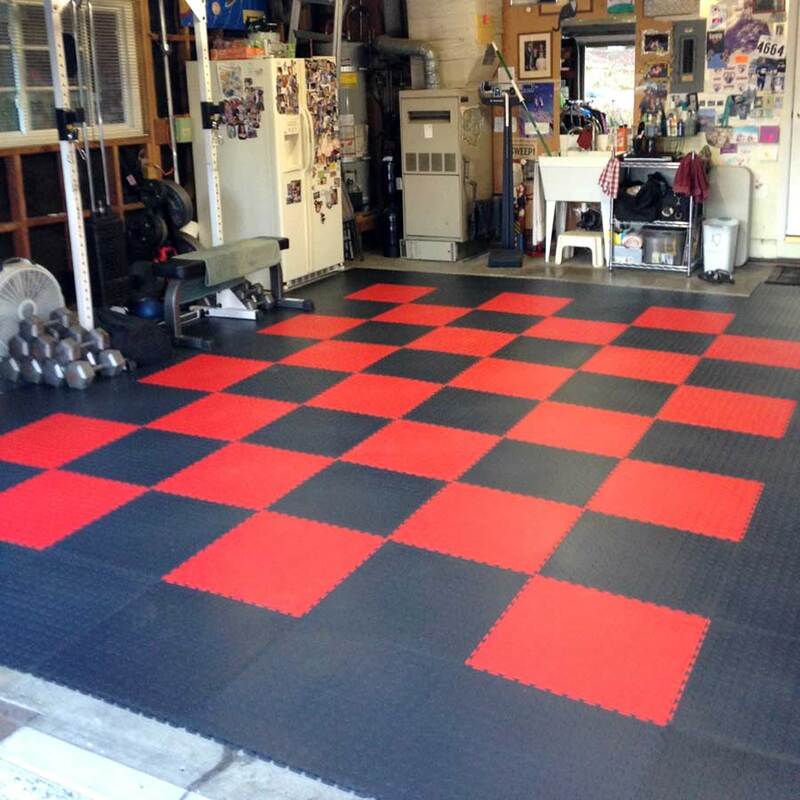 These floor tiles have been used successfully as home and commercial garage flooring, trade show flooring, retail store flooring, in stadiums and military bases, on storage shed and locker room floors, and in home gyms. These tiles have also been used in airport hangars, in commercial garages. These tiles typically work well in any area where an extremely durable, resilient flooring surface would be useful that is both attractive and easy to maintain. Our most popular slip resistant surface. Formulated to be highly chemical and oil resistant. Impact resistant to your tools or other falling objects. What are the temp limits for this? Looking to do a screened in patio that sees temps down to -5 during the winter. Little to no rain gets in unless very windy then just a misting. Just want to make sure this isn't going to get real brittle in low temps (NW Ohio area). Thank you Troy. Our 6.5mm Coin Flex Tiles would be able to handle the conditions found in your screened in porch. 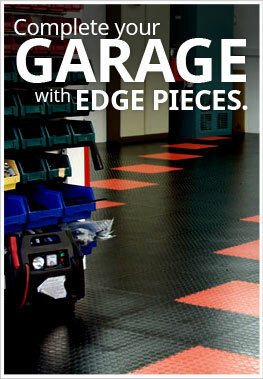 These tiles are meant to be installed in garages which are typically not temperature controlled. We have a basketball hoop in the garage (for the winter months). Will my boys be able to bounce the ball on the mat and continue to dribble if I install this as a new floor in the garage? You can bounce a ball on our 6.5mm Coin Flex Tiles. Want to put these in an auto dealers office. Can heels walk on this type of flooring and not puncture it? Heels will not puncture our 6.5mm Coin Flex Tiles. These tiles are made from a very durable flexible PVC plastic and can withstand not only the weight of a car but also can withstand the pressure brought on by a jack stand. Do you need to glue these tiles in place? Our 6.5mm Coin Flex Tiles are interlocking tiles and do not need to be glued to keep them in place. The weight of all the tiles interlocked together keeps the flooring in place. Can Coin Flex be used on my boat deck? Our 6.5mm Coin Flex Tiles can be used as flooring on a boat deck. Since these tiles aren't UV stable, they will fade over time in direct sunlight. These tiles are great for this application as they are very easy to clean, are slip resistant, and will not harbor any mold or mildew. 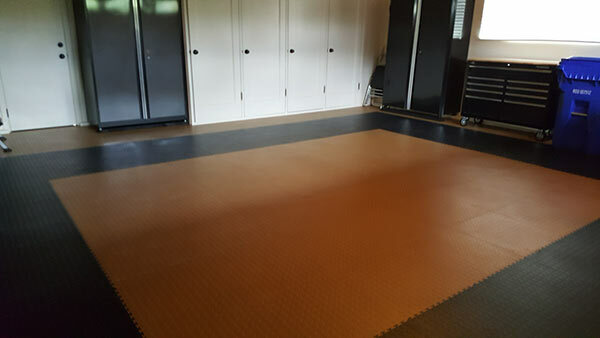 I recently removed some old roll-out rubber flooring that had wrinkled and stained beyond repair in my garage gym and replaced it with your 6.5 mm coin flex tiles. Wow, am I impressed. The product is sturdy, fits so snugly you can't see the seams and looks amazing. I was able to remove my old product and install the new coin flex flooring in about 3-4 hours. It surprised me how easy and accurately the flooring went down. I had no assistance, it was just me and the tiles. I would recommend it to anyone looking for a combination car/gym floor. I needed the flooring to be tough enough to handle my vehicle and to set my weights on. I also needed to cover some big cracks on my concrete floor. This 6.5 mm flex material is great for hiding ugly floor cracks.